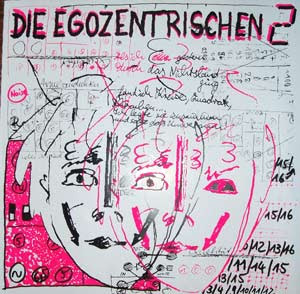 Wonderful LP by this german band.Crazed out minimal synth, a-la early DAF,Wirtschaftswunder way.Felix Kubin is featured in the line up too.Released in 1985 and re-released in 2005 in limited edition of 400 copies through Was Soll Das? label. Oh this is wonderful! A lost gem! Many many thanks for sharing this. ...and thanks for this one too. Downloaded it because of the cover. Tho the music isn't really my bag I liked the attitude. Would be DAF as it best. Or better. But is sounds like made around '80-'81 rather than '85. After listening to it a few times now I think its absolutely great! Now I also hear traces of both Goebbels and Residents. I just love it! Notice, this was the band (duo) of Felix Kubin when he was 13!